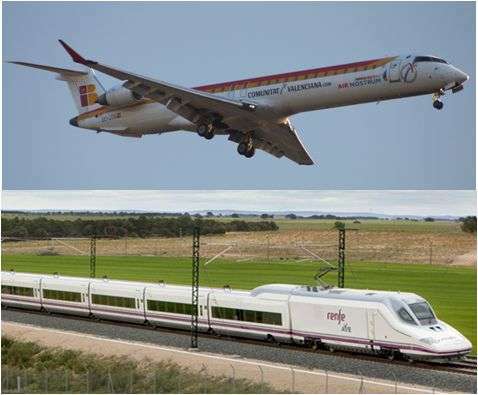 A team of researchers from two Spanish universities, UPM and URJC, in collaboration with MIT researchers, has developed a mathematical model that assesses the competition between both legacy and low-cost airlines, and high-speed trains. This new approach is able to estimate the modal distribution of passenger demand, optimize fleet assignment and generate flight schedule. This math tool provides valuable and useful information that will help airlines to efficiently face the competition of high-speed trains. Airlines and high-speed trains are increasingly competing for passengers, especially in Europe and Asia. High-speed trains usually compete by providing similar or even greater service frequency and better connectivity to city centers. Besides, HST is often perceived as the safer and more comfortable mode, this situation generates a redistribution of passengers between aerial and railway alternatives. Thus, a group of researchers, including the Professor Ángel Martín from School of Aeronautics and Space Engineering, gathered to study the impact of the uncertainty on regular aerial transport. In this way, researchers have developed a competition model accounting for the multimodal competition between aerial transport and high-speed trains and the aerial competition between legacy companies and low-cost companies. The study uses a nested logic model that captures the impacts of the decisions taken by aerial companies on passenger demand. At the core of this modeling approach is an integrated schedule optimization model that includes frequency planning, approximate timetable development, fleet assignment, and passenger demand choice. The computational results were carried out on realistic problem instances of the Spanish airline IBERIA and show that the actual airline schedules are found to be reasonably close to the schedules generated by our approach. Researchers also used this optimization modeling approach under multimodal competition to evaluate multiple scenarios involving entry of high speed rail into new markets, taking into account the possibility of demand stimulation as a result of the new services. This model was validated using data from markets that had an entry by high-speed rail in the past. The validation results show a close match between the predicted and the observed solutions. In addition this model can predict the impacts of future entry by high speed rail on new markets. Consequently, the proposed modeling framework is attractive from the perspective of the airline operators. It allows them to plan better for the impending HST entry by fine-tuning schedules, fleets, and fares. According to Ángel Martín, a researcher involved in this study, "The framework can facilitate careful evaluation of various scenarios (such as competitor actions, fleet changes, fare changes, etc.) allowing the airline to be better prepared to adapt to the changing competitive environment."